Discipline and creativity are used in the ballet dance classes with an emphasis on classical technique, turn out, flexibility, musicality and strength. 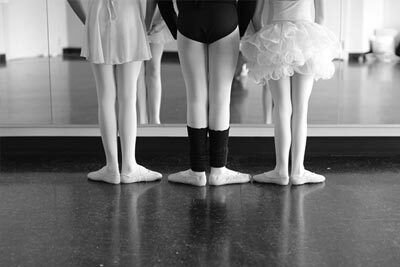 Our ballet classes are structured beginning with a barre warm up, with across the floor and centre floor exercises to follow. We follow the Royal Academy of Dance (RAD) teaching program. This program originated in England and is taught all around the world. The RAD syllabus begins at the age of 4 and trains ballet dancers all the way to their graduating year with us at age 18. Ballet class lengths ranges from 45 minutes to an hour and a half depending on the level of the class, and takes place once or twice a week. Ballet classes will begin in September and run through to June where they would participate in the year end recital. There is a strong technical component to ballet classes, with an emphasis on barre and across the floor training for the first half of the dance year. The year end recital is always a highlight of the year when the dancers growth and improvement is showcased on stage in such a special setting! Half way through the year ballet classes will begin their year end recital choreography. Recital costumes will be ordered in the winter and will arrive in the spring. The colour of the dress code for ballet classes change based on the level of the class however, is generally a bodysuit and tights with ballet shoes. Ballet classes grade 3-8 will incorporate a character component which requires a black character skirt and black character shoes. Our more senior dancers who take pointe training will also be required to purchase pointe shoes as part of their dress code. Our male dancers are asked to wear a white t-shirt with navy shorts or navy stirrup tights, laced up character shoes for the levels where this applies. We require that anyone taking a ballet class wear their hair in a classical bun to all dance classes. We are thrilled to offer our ballet dancers an opportunity to complete their RAD Ballet Dance Exams if they should choose. Ballet exam candidates are selected by the teacher, they are not mandatory but highly encouraged. We believe exams are a very positive learning experience for our dancers. Dance Exams allow dancers to set the goal of achieving a certain level/ set of steps on a timeline. Our examination dates are generally set in September and the dancers have all year to work towards a certain level of the syllabus. On this examination date, we invite certified examiners to the studio to put our exam students through an exam class where they the students will be given a grade. Following the exam, the students will receive a grading, and feedback on their ability and performance in this exam. Our dancers say that they find the exam process extremely rewarding and feel a lot of pride following the exam!